A line of wind turbines spin near Seiling, Okla. The Dewey County Courthouse is one of the newest in Oklahoma. The offices are spacious, and the courtroom has fresh carpet and shiny wood trim. County Commissioner M.W. “Junior” Salisbury is excited to play tour leader. Officials figured they would need 25 years to pay it off, but it took less than five. One major reason: wind farms. For more than a decade, Oklahoma embraced the wind industry with both arms — and a bunch of incentives and tax breaks. The state is now the country’s No. 2 wind producer and the nation’s largest wind farm is under construction in the panhandle. But as Joe Wertz from StateImpact reports, an oil crash and budget crisis has pushed lawmakers to pull back the economic welcome mat. Oklahoma started wooing wind companies in the early ʼ90s with generous tax breaks. The state is now the country’s No. 2 wind producer and Wind Catcher, the nation’s largest wind farm, is under construction in the Panhandle. But the cost of these incentives ballooned as the industry grew. State legislators started missing the money as oil prices crashed and state budget gaps widened. To understand how contentious the wind industry debate has become in Oklahoma, state Rep. Mark McBride, R-Moore, recently called police after finding a tracking device planted under his pickup truck and alleged a plot straight out of a political thriller. McBride speculated, to the officer, he became a target after supporting increasing taxes on the wind industry. McBride filed a lawsuit to find out who was behind the tracking device. The case is under investigation; the wind industry denies doing any wrongdoing. So an industry that was once a political darling is now at the center of a Capitol catfight with battle lines drawn in dueling press conferences and TV ads. 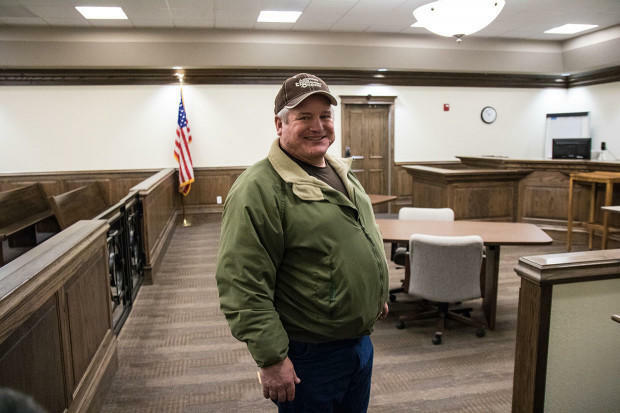 County Commissioner Junior Salisbury in the courtroom at the Dewey County Courthouse in Taloga, Okla. Sales tax revenues from nearby wind farms helped the county pay off the new building before it opened, Salisbury said. Wind incentives have proved essential for many landowners and local governments. Commissioner Salisbury says wind farms generate substantial revenue for his local schools and he’s grown more frustrated with state lawmakers over the years as they’ve steadily ended incentives for the wind industry. He’s also mad at some legislators who want to pull back tax credits already promised to wind companies. Salisbury is also pushing lawmakers to vote down a new tax on wind-produced electricity proposed by Gov. Mary Fallin and groups backed by the state’s influential oil industry. “I promise you, I’m gonna get in there and fight harder and harder to swing this back our way,” he said. A state revenue package backed by prominent business leaders that included a wind production tax was defeated in February but still has support in many political circles. 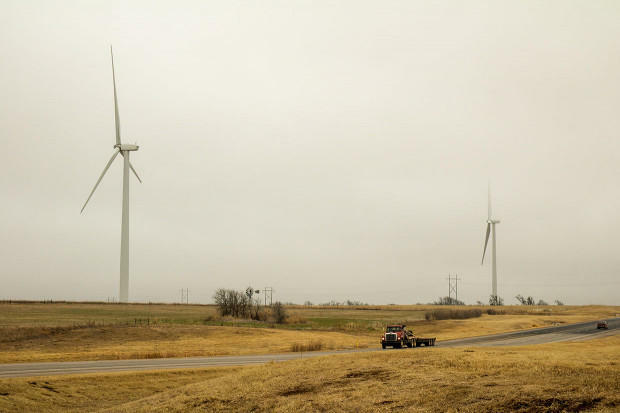 The Wind Catcher project in the Panhandle is being built without using any state tax credits or incentives, said Stan Whiteford, spokesperson for Public Service Company of Oklahoma, the wind farm’s co-developer. The incentive rollback is causing other wind companies, however, to reconsider. One company, E.ON Climate and Renewables, signed lease agreements with more than a hundred landowners representing 60,000 acres in Dewey County for a two-part project creating a 280-megawatt wind farm near Vici. E.ON invested millions laying the groundwork for the project but canceled its plans in December 2016. “We just couldn’t take the risk in Oklahoma,” Logsdon said. Instead, the company used the money to invest in a $400 million wind farm that just started operating in south Texas.